Emotions attach to events and people, reappearing and disrupting the moment. Awareness of faulty connections can free us from painful reminders and allow for better adjustment to life. Life is a feeling experience. When underlying emotions are positive, comforting and warm, we enjoy life. When they are chaotic, disturbing and fearful, we struggle. Articulatable thoughts are intimately woven into the feelings. We feel, we think, and we label. We attribute surrounding experiences to the felt experiences. The mental describing of an experience lags a few microseconds behind the felt emotion. We feel something and then try to explain, what we felt and why we feel it. Our thoughts have power to regulate, instigate or magnify the initial feeling. Our minds exploit feelings to supplement deficiencies in the ego, protect painful recognitions, and justifying badness; but thoughts can also augment the joys and pleasures, making a good experience great. Human emotions have drawn the attention of philosophers for centuries. Early thought believed emotion to be a wild horse to be tamed, some modern thinkers glorify emotion as hidden wisdom, providing infallible guidance. Both theories have threads of truth; but our inability to distinguish where emotions end, and cognitive thinking begins complicates any definitive assessment. We feel life through emotions. Understanding our experience begins with feeling our experience. Mindfulness practices can play a vital role increasing our capacity to feel the underlying emotions. As young children experience emotions, their developing minds adapt to the wild ride of feeling, experiencing fear, joy, anger and sadness. The child’s pre-frontal cortex can’t mitigate the chaos of extreme emotions. The child has limited power to regulate. The youngster relies on attentive caregivers to intervene, soothing the emotions and satisfy unfulfilled needs. Through healthy support and example, the caregiver instills the developing child with the skills essential for easing the strains of searing emotions (see Emotional Attunement). With maturity and proper guidance, a child forges skill to monitor emotions and adapt to the frustrations and hazards of living. But when proper childhood conditioning and nurturing is lacking, all is not lost. The brain, still supple, can still improve our relationship with emotion. "As young children experience emotions, their developing minds adapt to the wild ride of feeling, experiencing fear, joy, anger and sadness." Mindfulness brings the emotions, previously ignored, projected and denied, back into focus. At first, exposures to the hidden waves of feeling discomfort. We face what previously frightened. But these feelings contacted in youth may have been overwhelming. Now in adulthood, we have additional resources. Within normal constraints, we can subtly change the emotional hard wiring of our brain, bringing to life the richness of experience. The brain remains malleable throughout our lives. When we learn, we rewire the brain. Automatic emotional responses must be regulated for growth—some emotions, when blindly followed, lead us off course and into hazardous consequences, further deteriorating our lives. We must identify errant impulses and re-direct action towards fulfillment of long-term intentions. But changing engrained reactions is no easy task. Our lives are largely automated, reacting to past learning—external trigger, emotional reaction, culminating in a habitual behavior. Blurring the wrongness of behavior, our thoughts protect the ego by articulating believable justifications—even when the behavior is destructive. Justifications happens seamlessly. Unless given forced attention, destructive behaviors seem appropriate and continue to haunt our lives and destroy our futures. Healthy change demands an intervention, creating new associations with the old input. When, through mindfulness, we recognize an emotional reaction to an external trigger, we have the glorious opportunity to interrupt the tiresome cycle. Just as a healthy caregiver steps in and walks the child through their emotions, guiding to productive responses. We can play this nurturing role with our stubborn juvenile brains. It all starts with awareness—we can’t purposely interrupt a process, we fail to notice. As we attend to experience with openness, we begin to unravel the complex weaving of emotions, discovering the meddling influence of the past. The discoveries naturally soften reactions. We are less likely to act the current stimulus, knowing our conditioning from the past is playing a significant role in the emotions of the present. The deeper our understanding of the complexities, the more the energy of the present is dispersed. Emotional maturity doesn’t magically cure discomfort. It just changes our relationship with discomfort. Sculpted and evolving over millions of years, our emotions guide behavior. The brain learns from experience—scanning, recording and analyzing. Much learning is expressed in the emotion, pushing or attacking dangers and opening and inviting opportunity. We need emotion to successfully draw input from the environment and actively engage in living. But some of the learned associations are wrong. Chaotic pasts make tangible associations difficult to detect. Unpredictable parents, dangerous and hurtful encounters, and other extreme events confuse learning. We derive faulty conclusions, prompting mismatched emotional reactions to future events. We may experience fear, anger and sadness when the immediate environment isn’t threatening. We perceive a much different environment than reality. The mistreated dog may viciously bite the rescuer. We react much the same. Changing childhood programming takes time. 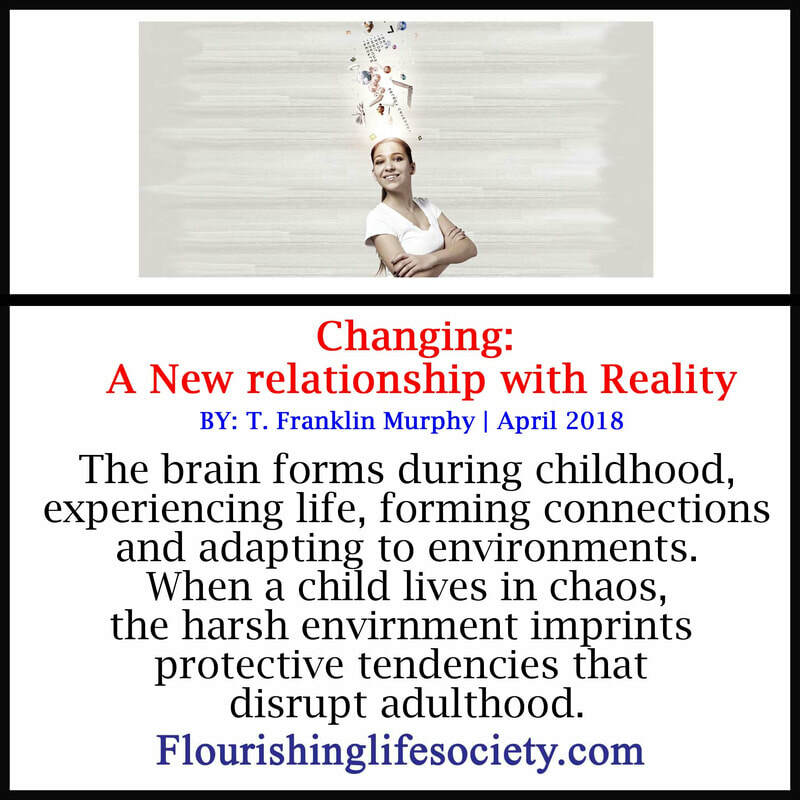 Neuroscience is making new discoveries, uncovering new approaches to relieving the tattered and scarred connections. Recovery is possible. Treatments are available. Professional help often necessary. Mindfulness can help. Identifying the previous hidden programs and creating a brief separation from automatic responses. Many quickly tire of attentive watchfulness and return to past practices of fanciful dreams, defensive avoidances, and clever excuses, maintaining the same destructive associations with the past. We must cut through the fog of faulty perceptions, catch occasional glimpse of reality and step in the right direction. Easily written, joyously received but is challenging to face the discomfort, and courageously work through the misdirected impulses. But futures depend upon these courageous changes. We change ourselves and then bestow the gifts upon our children.